31st January 2018, New Delhi: Since last year, railway budget was made a part of the bigger union budget. But this does not reduce its importance in any way. Country’s largest employer continues to be a government service that touches every citizen. Railways is also the country’s largest employer, it ferries lakhs of people as well as goods across the country. Being world’s 4th largest railway network, it touches the lives of almost every Indian while covering all 29 states and 7 UTs. Unlike many other countries, India does not have private railway operators hence is a monopoly of the government. 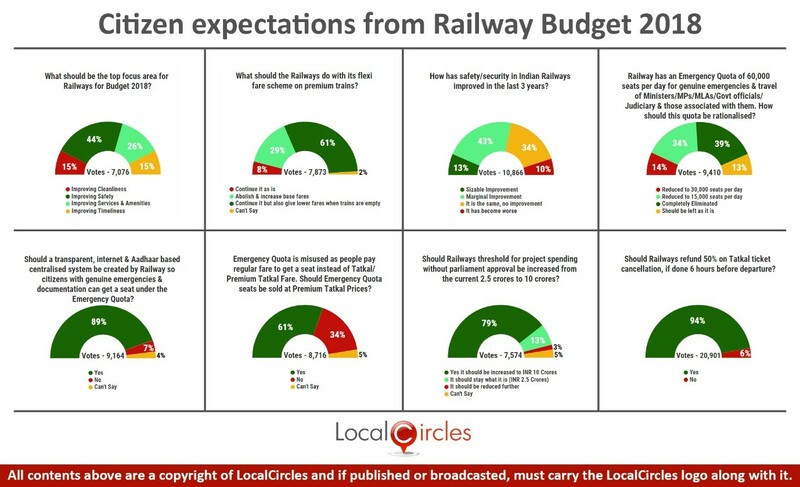 LocalCircles conducted a large survey to ascertain citizen’s expectation from the upcoming budget. The survey received a total of more than 65,000 votes. 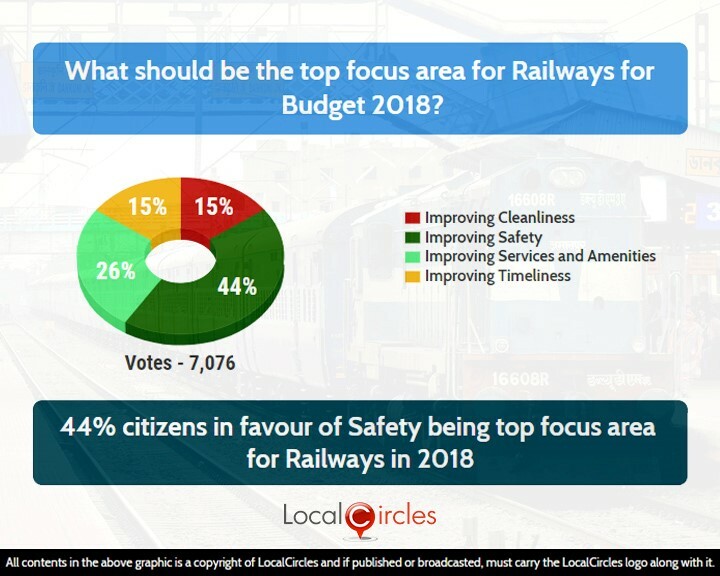 The first question asked what should be the top focus area for Railways for Budget 2018. 44% chose improving safety, 26% chose improving services and amenities, 15% chose improving cleanliness while 15% chose improving timeliness. The spate of accidents that occurred last year seems to have affected the general perception of safety in Railways and hence it is being cited as the most important area. 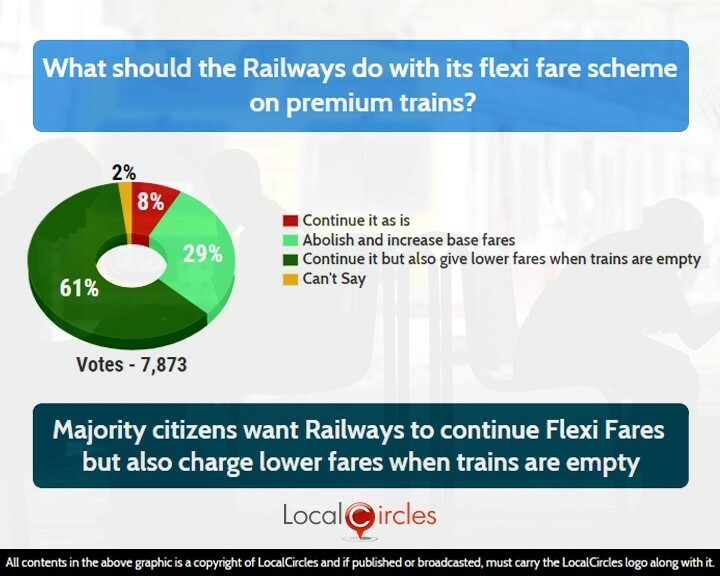 On the issue of flexi-fares in premium trains, around 61% citizens want it to continue but also want lower fares when trains are empty. Approximately 29% want flexi fares to be abolished and base fares increased, 8% want it to be continued as is while 2% were unsure about it. Flexi fares are followed by Railways to ensure that they are able to benefit from high demand on certain routes and thus increase its profitability. 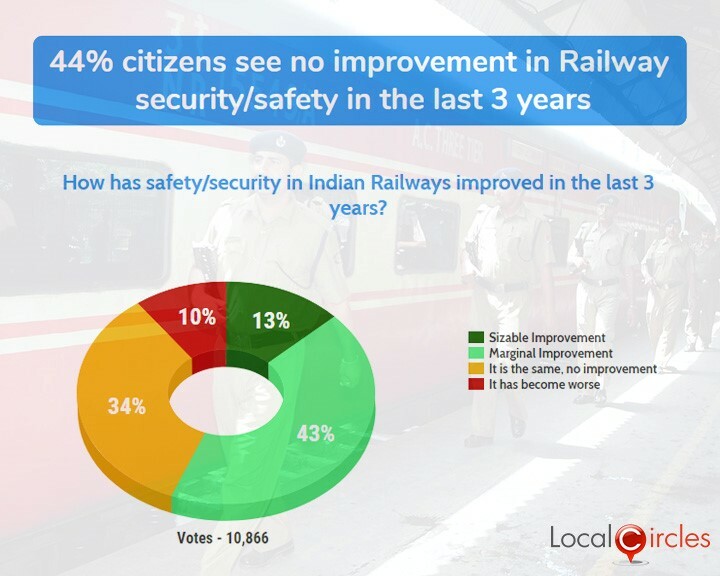 The third poll showed that 43% believe there has been a marginal improvement in safety and security in Indian railways in the last 3 years and 13% said this improvement has been sizable. 34% said there have been no improvements and 10% said it has become worse. 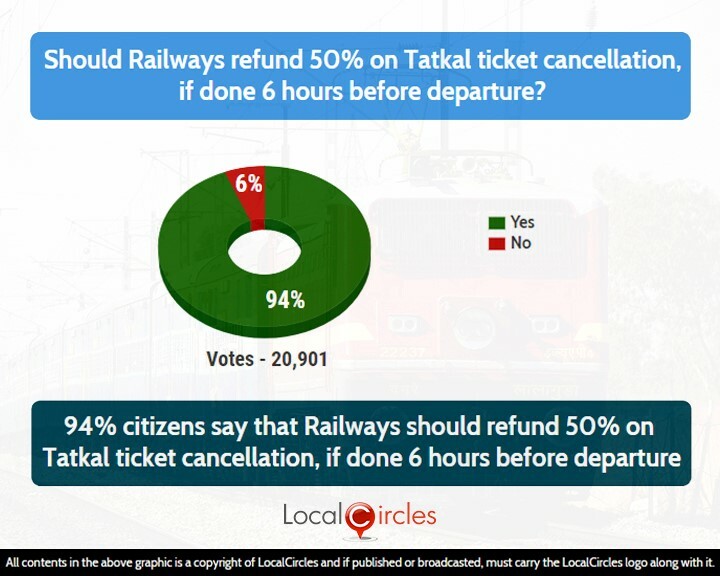 The following question asked if railway should refund 50% on Tatkal ticket cancellation, if done 6 hours before departure. 94% responded in a positive while only 6% replied in a negative. 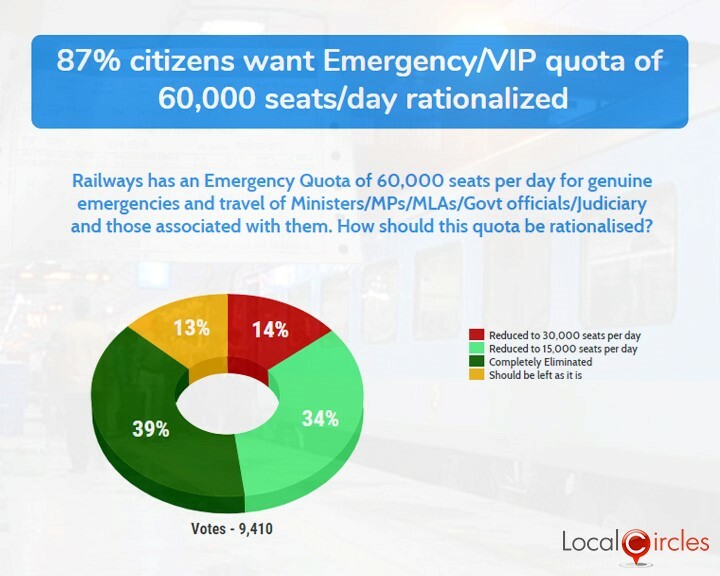 In a poll conducted a few months back, people were asked how should the emergency/VIP quota of 60,000 seats per day be rationalized. In response, 14% said it should be reduced to 30,000 seats a day, 34% said it should be reduced to 15,000 seats a day, 39% said it should be completely removed where as 13% said it should be left as it is. With the functioning of the IRCTC website becoming smooth and ticket booking becoming easier, people feel that IRCTC should also give an option on their website where people can book emergency quota tickets on presentation of required documentation. The next poll asked citizens if the emergency quota seats should be sold at premium tatkal rates. 61% respondents replied in an affirmative, while 34% replied in a negative. 5% were not sure about it. The government has taken steps recently to reduce VIP culture on the roads. It is high time that something is done to reduce the VIP culture in railways too and its functioning is made transparent. 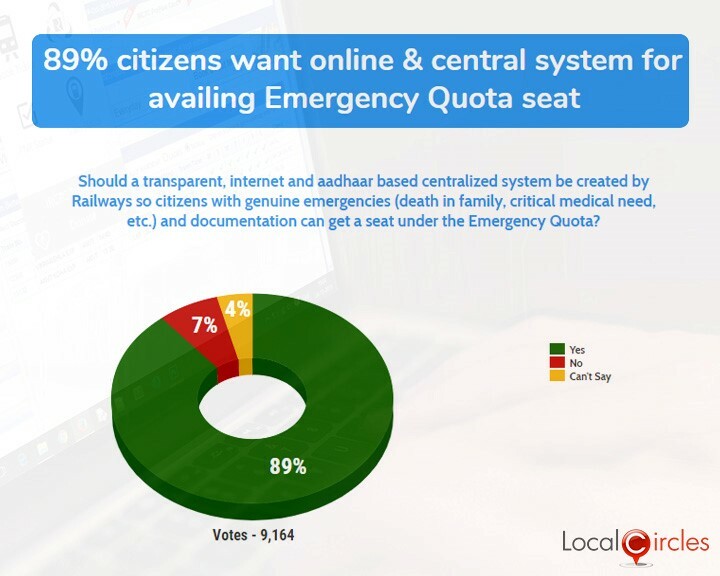 As demanded by the citizens, the emergency quota seats should be made more accessible while reducing the number of quota seats significantly to put railways on the road to profitability. 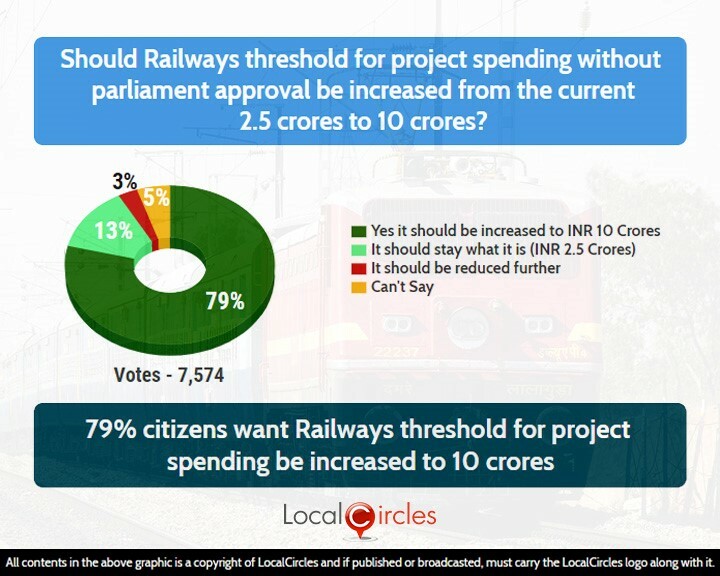 The last question asked if railway’s threshold for project spending without parliament approval be increased from the current 2.5 crores to 10 crores. 79% said yes it should be done, 13% said it should stay where it is currently, 3% said it should be reduced further while 5% were unsure about the choice. Citizens have a lot of hopes from the new railway minister and they believe that the existing loopholes in the railway system would soon be plugged in the upcoming budget.